There’s nothing like having the opportunity to teach budding learners who are brand new to the school experience. Preschoolers and Kindergartners are some of the most entertaining and lovable students to teach. They can also be the most challenging. Young minds and little bodies have lots of wonders and wiggles and that can create some frustration for teachers when it comes to keeping those little ones on task. However, with the use of a little creativity and a few amazing interactive whiteboard activities, you can create lesson plans that will keep those busy learners focused and engaged throughout the day. Below are a few tips that will help you create some truly awesome smart board preschool and kindergarten lesson plans! Teach your little learners about numbers, shapes, patterns, and other math concepts with some of Gynzy’s math applications and planning guides. The Gynzy My Lesson’s tab has a number of lesson plan ideas and templates that are classroom ready. Use the Finding and Building Shapes lesson to help your students understand the difference between common shapes then help them sort every-day objects into the proper shape category. The bright colors, fun pictures, and engaging content keep young students occupied as they play their way to gaining knowledge. The shapes lesson template also includes a fun shapes song that your class will love to sing as well as a shapes printable book that will give your little students the chance to color and cut out each of the new shapes they’ve learned. Other pre-made lesson plans for math include Pattern Making, Numerical Order, and Counting to 10. In addition to the My Lesson Plans tab, there are also a variety of interactive whiteboard games that will help draw the attention of young students. Two examples are highlighted below. The kids learning games ‘Counting How Many‘ is a fun game that provides students with four different cards all with the same picture on them. However, each card has a different number of that picture displayed. For example, the first card might have 5 suns, the second card might have 7 suns, the third card might have 1 sun, and the fourth card might have 3 suns. The game will then ask the students to identify which card has 3 suns. This is a great game for either reinforcing counting concepts that are already mastered or for teaching the concept to new counters. You can count the pictures on each card with the class until they find the card with 3 suns on it. The colorful pictures help to capture the attention of young students so that counting skills can be taught. This sorting activity allows you teach your little students about sorting by color, amount, size, or shape. Using the “Settings” button, select the number of objects and the type of theme you wish to use for your lesson and click “Save.” Your game is now ready to play. This tool can be used with the entire class or on a one-on-one basis. For whole class use, tell the students how they will be sorting the images. 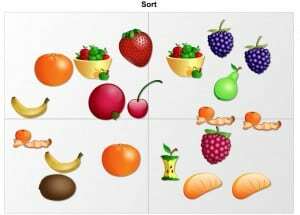 If you are sorting by color and are using fruit for your theme, have volunteers come up one at a time and show you where they should group one of the pieces of fruit. Since you can control how many items are shown on the screen, you can include enough for each student to take a turn. Gynzy is also home to dozens of language arts tools and lesson plans for your interactive whiteboard that can help you get started on preschool and Kindergarten planning. By using the My Lessons tab, you can select from a number of ready-to-use plans that will help your class learn all about language arts. For example, each letter of the alphabet has its own lesson plan that allows you teach letter sounds, letter identification, and letter recognition. Students can find the letter they’re learning about in a number of commonly recognized pictures and logos so that they can begin to extend their learning outside the classroom. 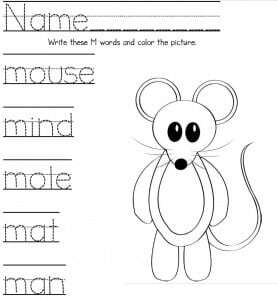 The plans also include printable letter pages where students can practice tracing and writing each of the letters. After you’ve checked out the My Lessons tab, take a look at some of the games you can also incorporate into your teaching schedule as fun reading games for kids. Two have been outlined below. This colorful and interactive scene is a great way to introduce new vocabulary as you and your students explore the image. This tool allows you to zoom in on certain elements of the scene as well as move the picture around to highlight certain points. You also have the ability to show or hide the labels and to reveal more information about a specific label by clicking on the text. Your little students will love to look at the beautiful pictures and will be excited to see what new images pop up when you click on the text. This tool not allows you to discuss new vocabulary, it also gives you the chance to talk about new concepts that range from weather and plants to sports and arts and crafts. This fun memory games for kids allows you to create your own memory matches by adding words or letters to the game list. For preschool and Kindergarten, create a game that matches all upper case letters, all lower case letters, or a combination of both. Little learners love the challenge of finding pairs and will enjoy playing it either with a partner or as a class. This game makes a great reinforcement and recognition activity. Teach your young students all about Science by incorporating one of the lessons under the My Lessons tab. Click on the Themes folder in the My Lessons section then find the plans for Baby Animals. This classroom-ready lesson plan starts with an engaging video then goes on to sections where your little learners can hunt for baby animals and early life cycle stages of insects. 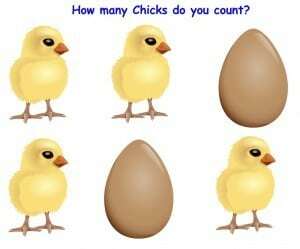 They also have the chance to count how many baby chicks and how many eggs they see on the screen which brings a math element into the lesson as well. Once you have finished the interactive whiteboard part of your lesson, you can provide your class with the included baby chicks coloring page for a quiet activity afterward. Once you’ve used the Gynzy lesson plans, keep the learning going by having your little students play some of the fun and interactive Science games. Two favorites are outlined below. This amazing Animal activity allows young students to identify not only animals by name but also by where they can be found. At the top of the screen is a picture of the animal. At the bottom of the screen are three different location choices: the zoo, the farm, and the home. Start the game by asking your students what the name of the animal is. 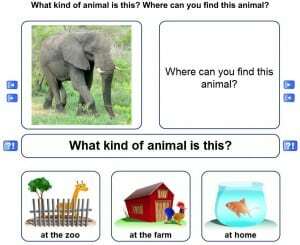 Once they have correctly identified it, go on to ask the students where the animal can be found. You can either take the class answer or you can have students come up individually to make their selection. Have them decide if the animal is found at the zoo, at the farm, or at home. Once they have made the right choice, you can expand on the lesson by going on to discuss animal facts and trivia to help them learn even more. Use this interactive tool to help your little learners differentiate between the different landscapes they see around them. A picture of a landscape is displayed at the top of the screen. Beneath it are four different word choices. Help your students identify which type of landscape they are looking at then help them find the word that matches. Drag the correct word beneath the picture then click ‘Check.’ A happy face is displayed when the answer is right. This game will help your students learn more about the world around them and will also introduce them to new vocabulary words. 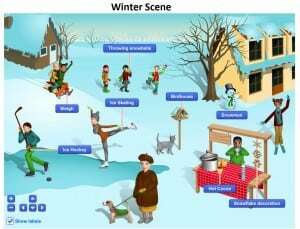 Take this activity to another level by talking about types of animals and plants that are found in each landscape and what kind of weather is usually common there. While it’s true that younger learners have shorter attention spans, using the lesson plans and activities above will allow you to maximize the learning time you have. They will also help you keep students engaged so that the wiggles stay away a little longer! This means your new learners get more education time than they do when you use a traditional lesson plan. Since little minds learn best through activities, educational games for kids, and interaction, it also means that you’re giving them a chance to retain more information. Regardless of the subject you’re teaching, Gynzy will help you find the tools, lessons, and learning games for kids for your interactive whiteboard that will keep your preschool and Kindergarten learners happy, focused, and on task from start to finish!